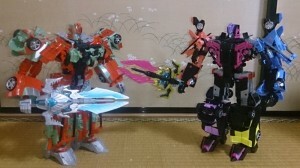 Images of UW Megatronia have been posted by Twitter user, @kaseki2010. 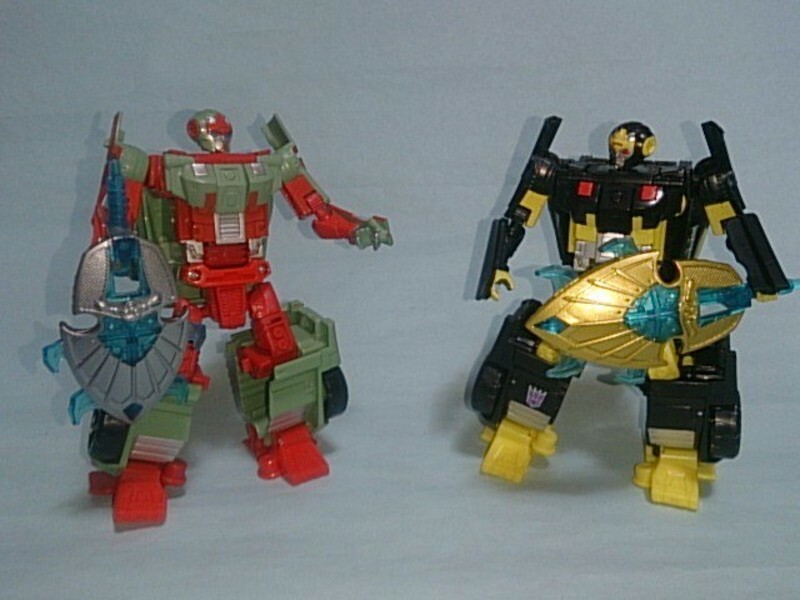 Here we can see each member of her combiner team in comparison with the Rust Renegades AKA Victorion. 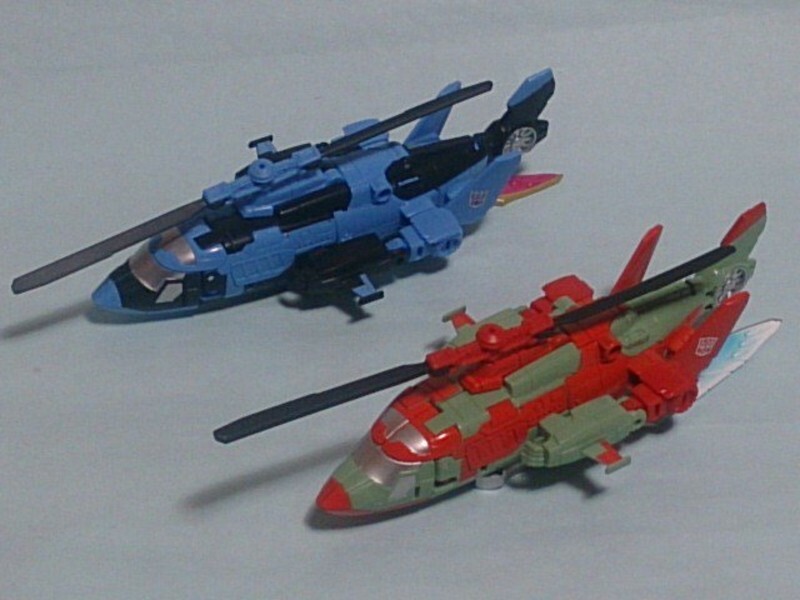 While both sets have similar molds each of them sport very different paint schemes. 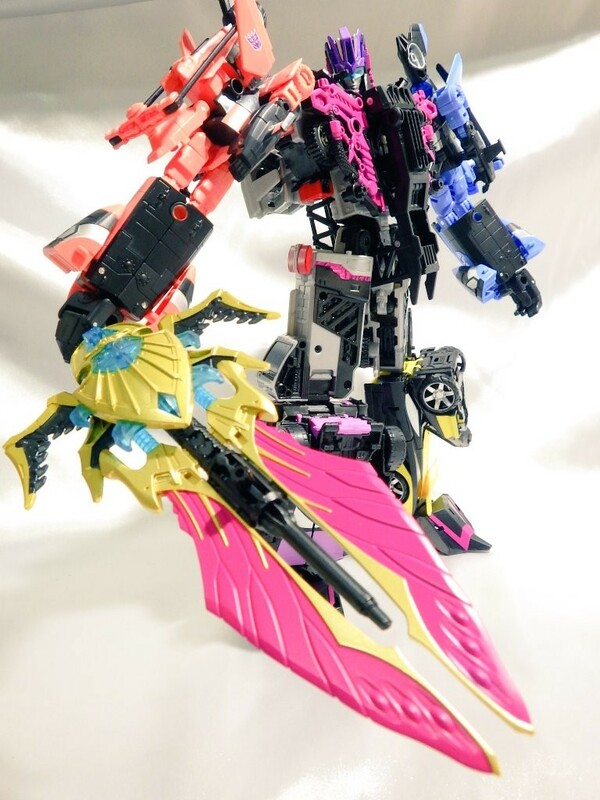 The biggest difference between the two is that Megatronia's components each have black paired with another bold color. 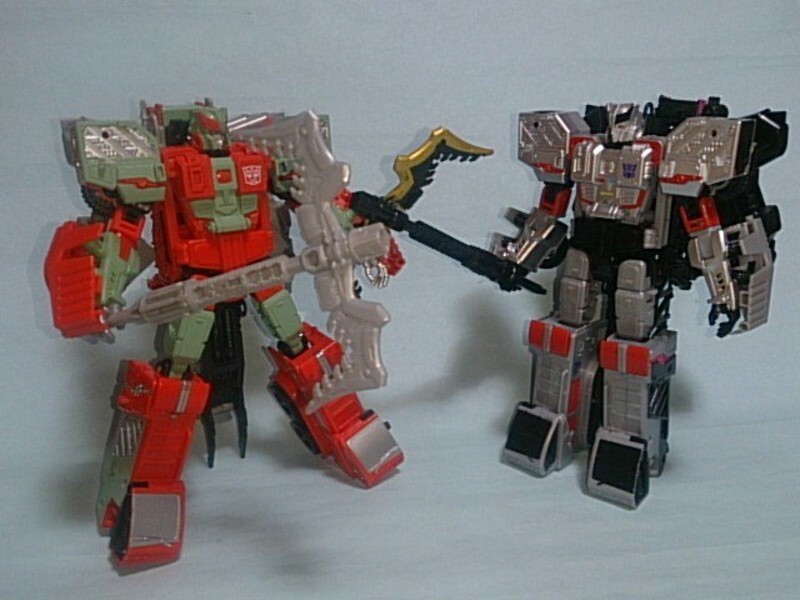 On the other hand Victorion has a unified color scheme. 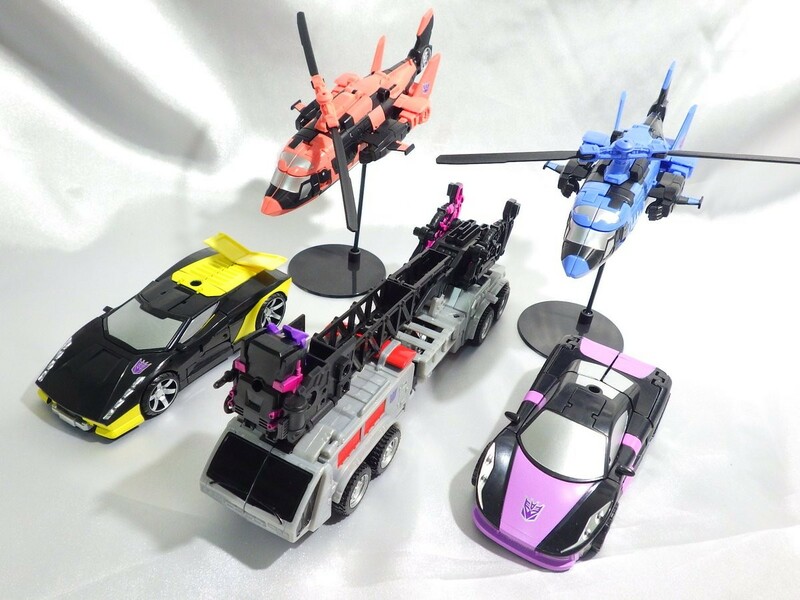 Some may find Megatronia's colors more exiting, while others prefer the matching look. 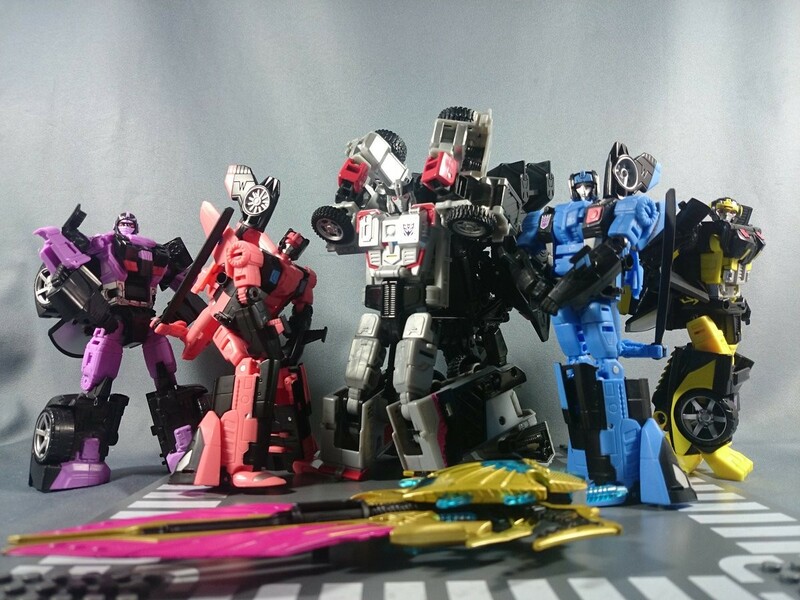 Megatronia has a lot of silver paint which collectors can truly appreciate. 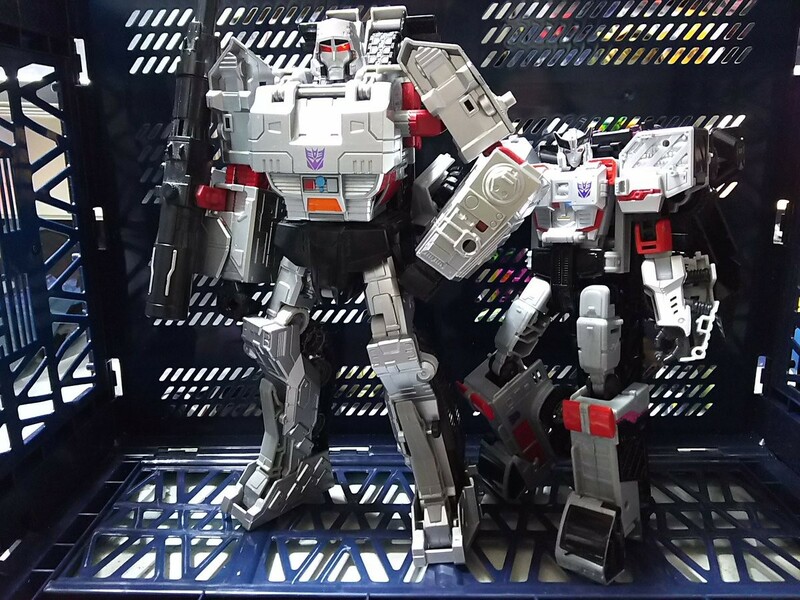 The shape of this mold makes her mirror Megatron as his more feminine counterpart quite nicely. 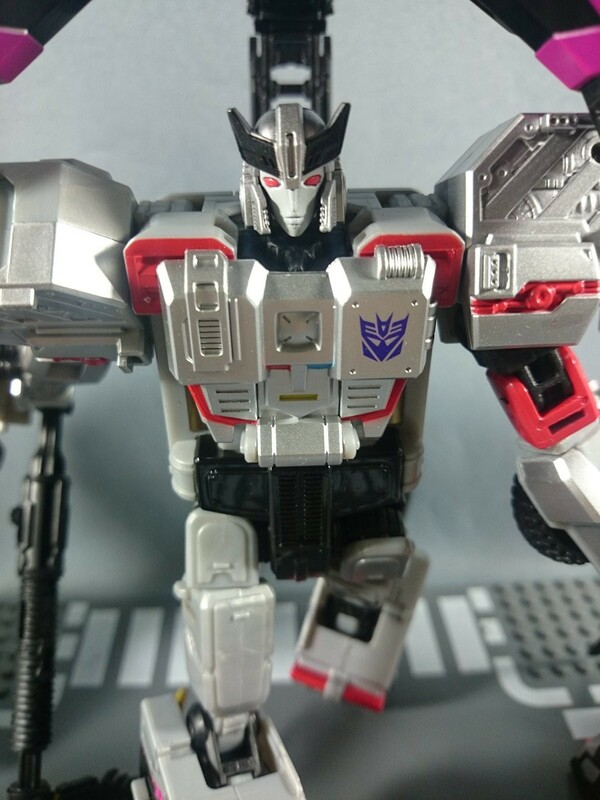 The details of this figure look excellent in their metallic finish. 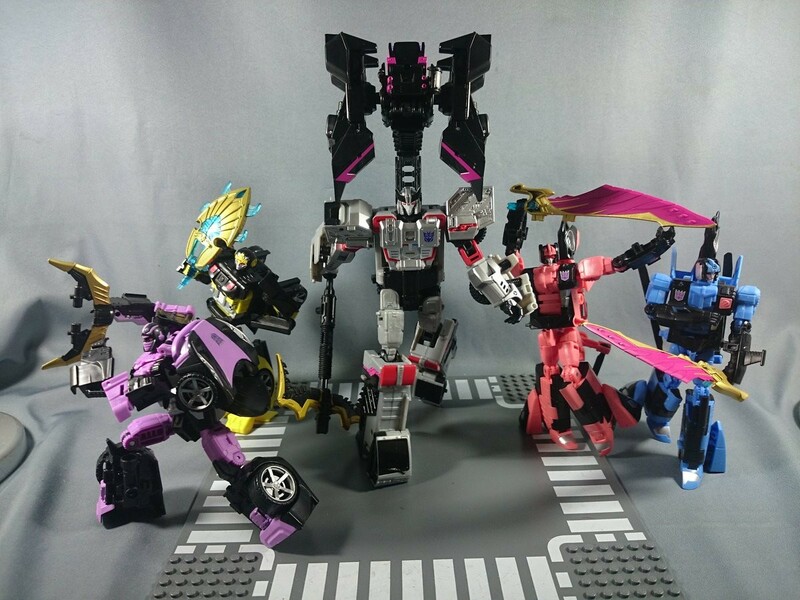 Each of the members of Megatronia's team has a different pattern than the Rust Renegades. 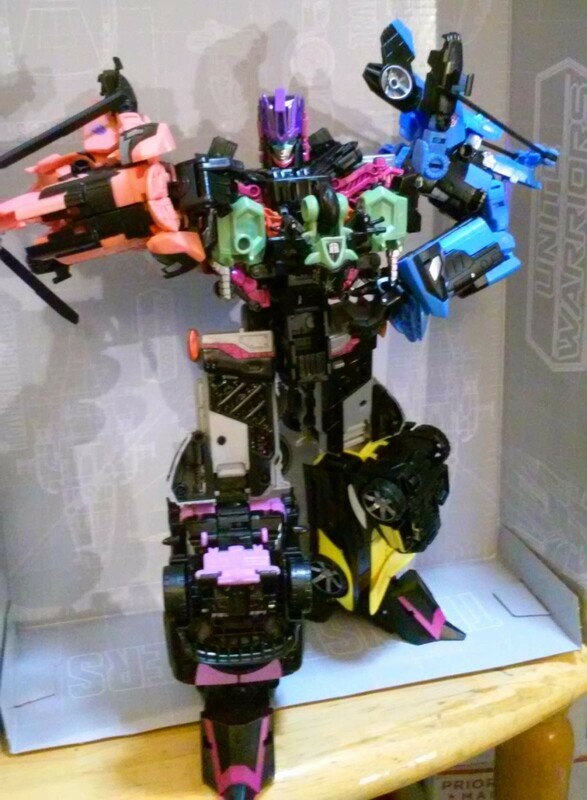 The dark black makes the neon colors pop. 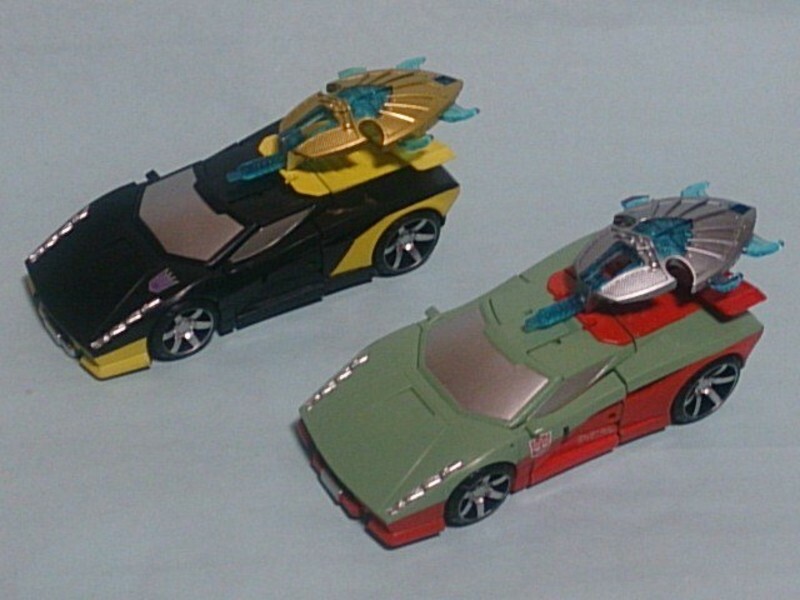 This helps differentiate them so that they look more refreshing to those who might wish to own both. 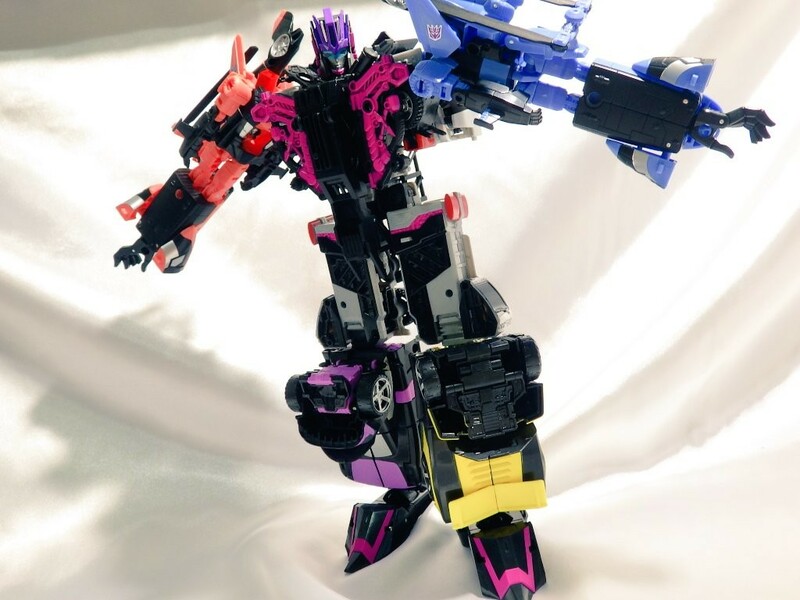 I would like to take a moment to point out that it appears that the issue of Pyra Magna's miss-assembled knee joints possibly been corrected for Megatronia. Feel free to discuss your favorite color scheme in the comments! 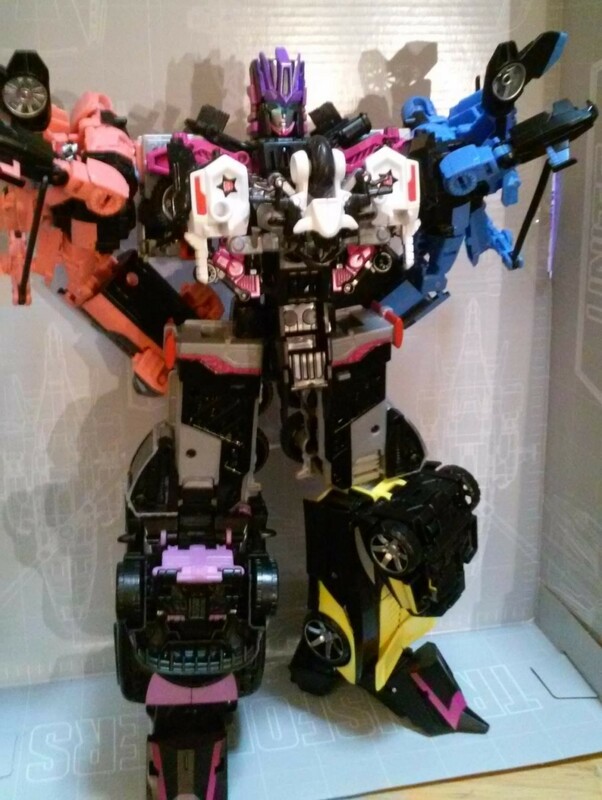 I need to figure out how to make an arm cannon for this combiner. I have noted that the knee joints on the voyager figures will punch through the shin plastic no matter which way that tab is oriented. The only option is to dremel or file off that little nub that juts up. 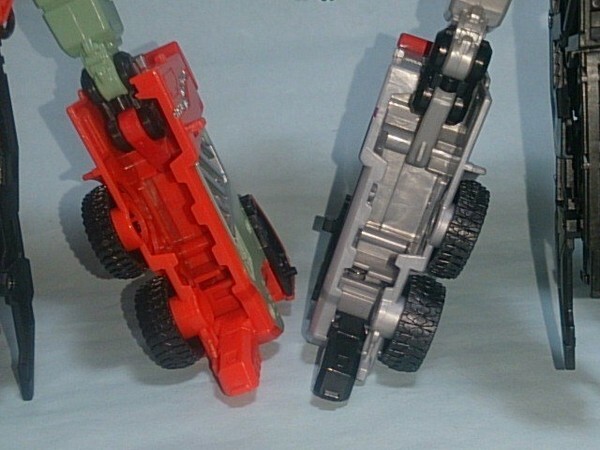 No matter how it's rotated, it jams up against the shin plastic. 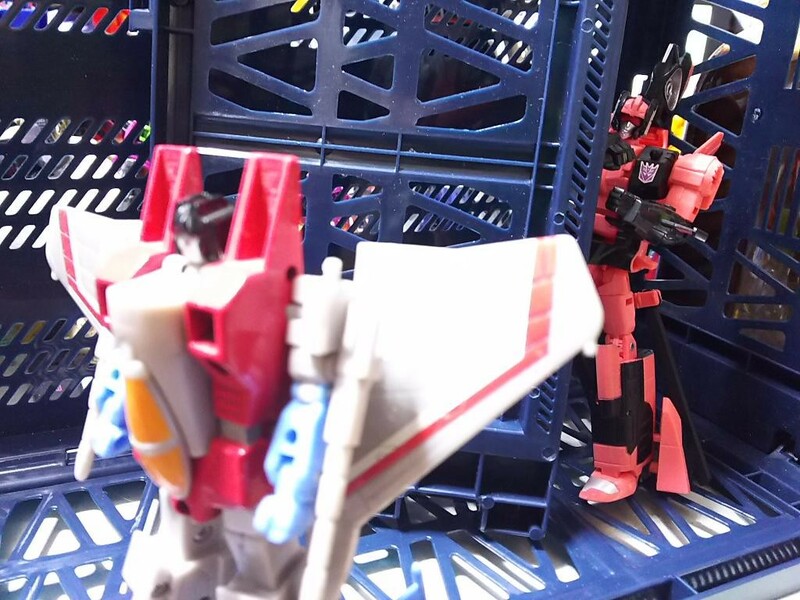 The direction in which the nub is inserted during manufacture only seems to affect the severity of the damage it causes when transforming to robot mode. The only way to NOT damage the shins (without kit bashing the thing) is to not click the thighs fully in place. 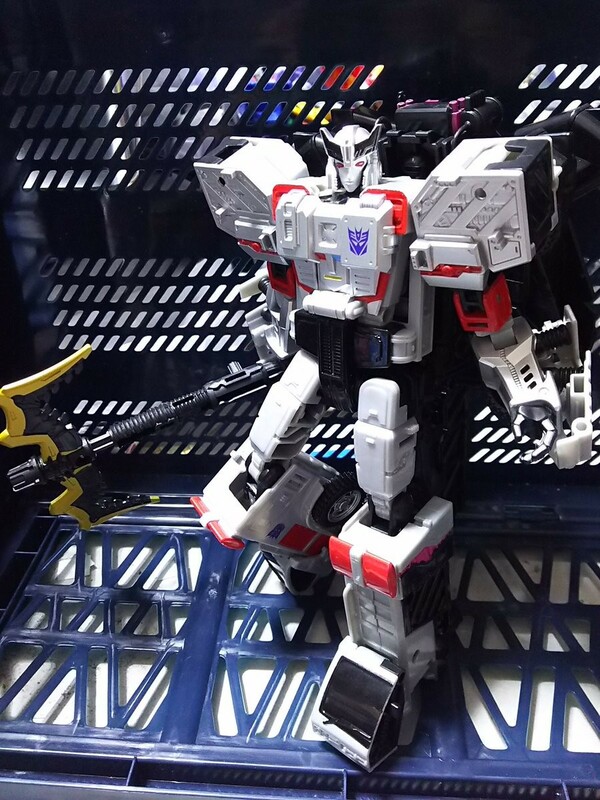 This of course make the voyager taller, but also makes the knee joint much less secure and prone to collapsing. Thank you Sabr. 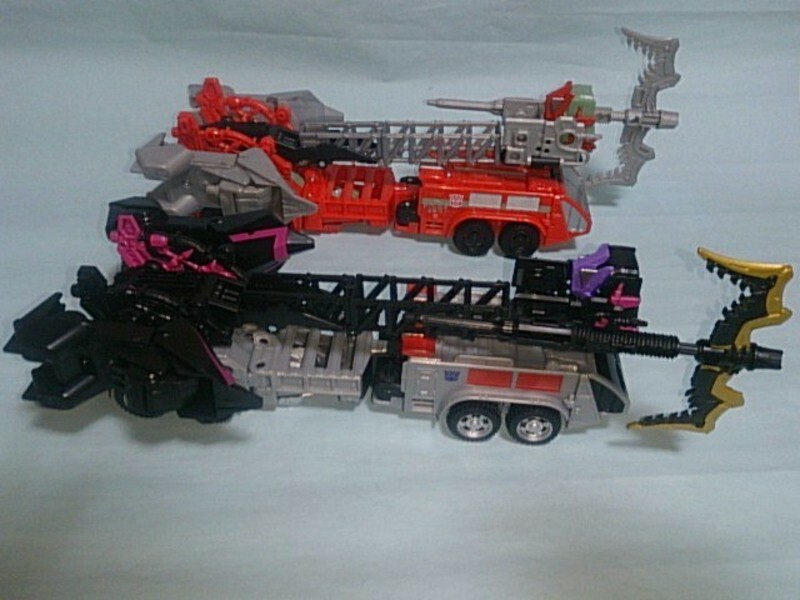 I am not on Twitter, but I did see one very similar to that from a seller on eBay. Its better than what we've had thus far, but the ends are cut off. 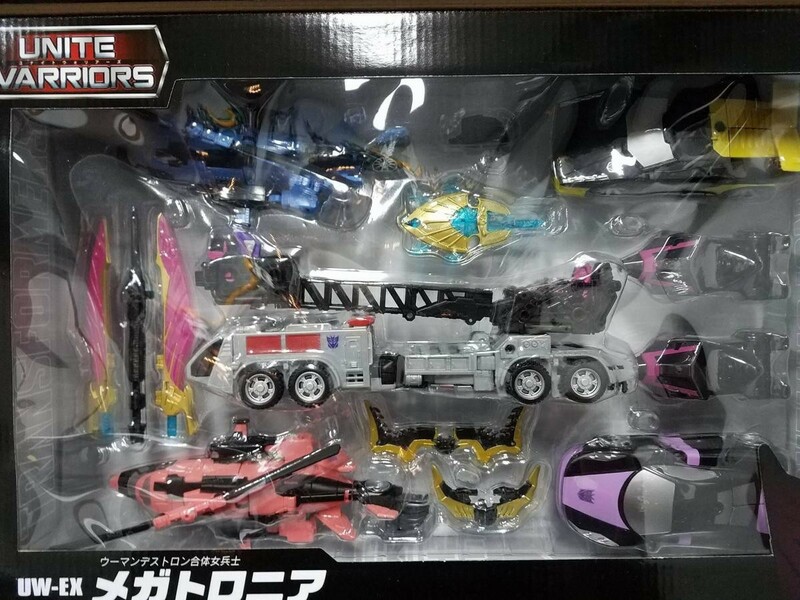 Hopefully soon we'll get a nice clear pic of the full box in all its glory. Just a gal enjoying the nightlife. o.supreme wrote: Thank you Sabr. 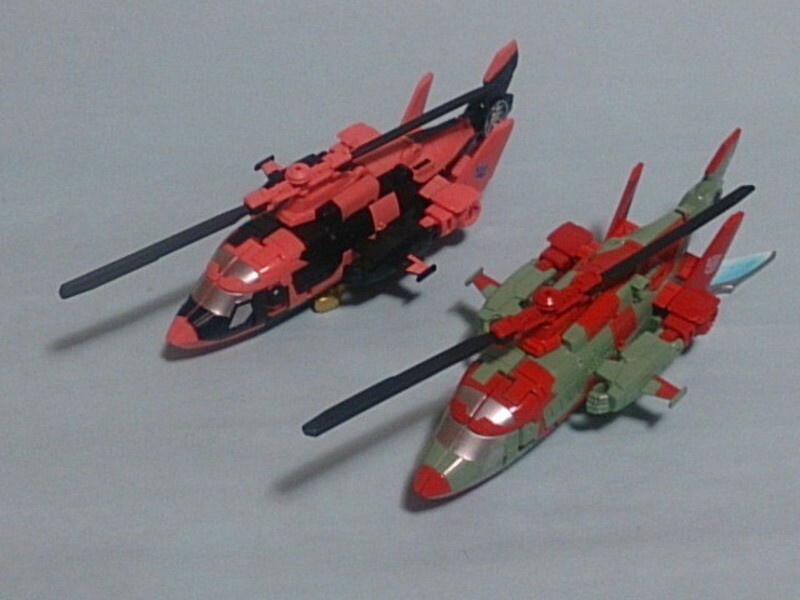 I am not on Twitter, but I did see one very similar to that from a seller on eBay. Its better than what we've had thus far, but the ends are cut off. 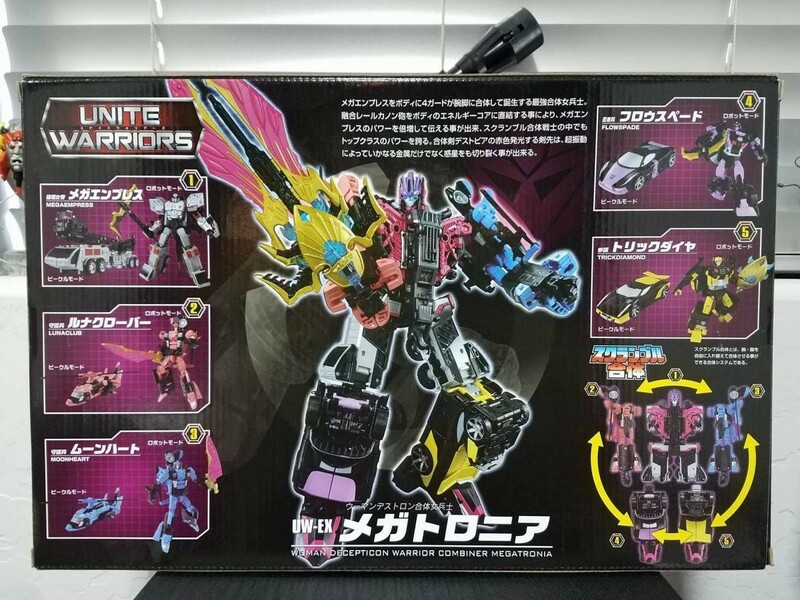 Hopefully soon we'll get a nice clear pic of the full box in all its glory. 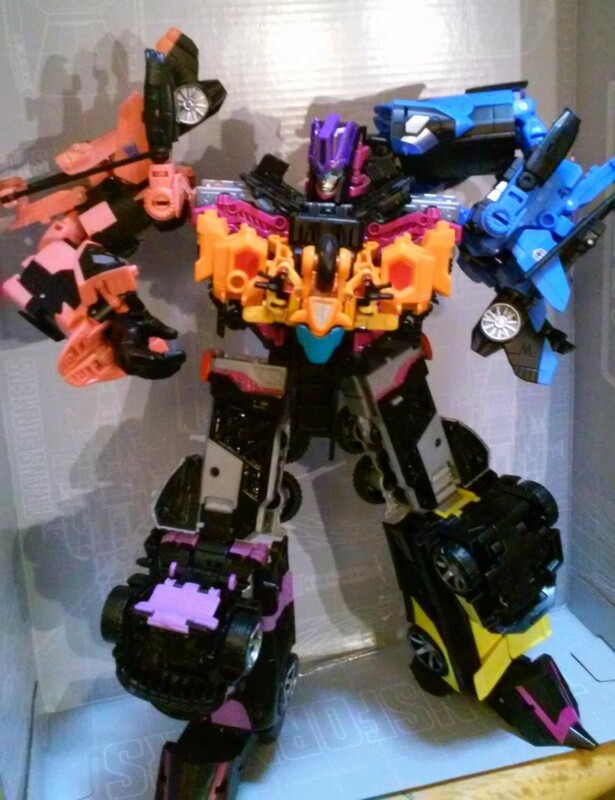 I'm not one of these TAKARA MAKES EVERYTHING BETTER guys, but this Megatronia is in every way better than Victorion, but one. 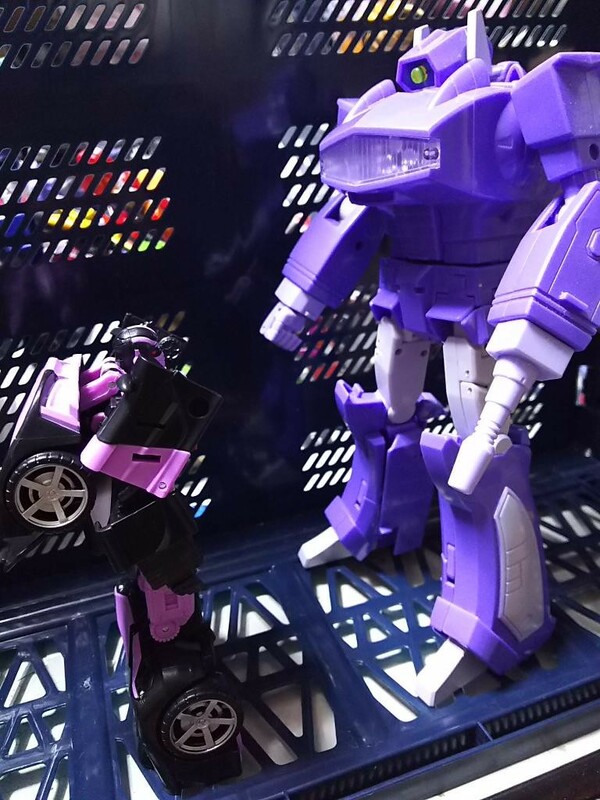 Megatronia needs Rustdust. She looks silly without her. Thanks all, that one pic would be perfect if the coin weren't in the way. . 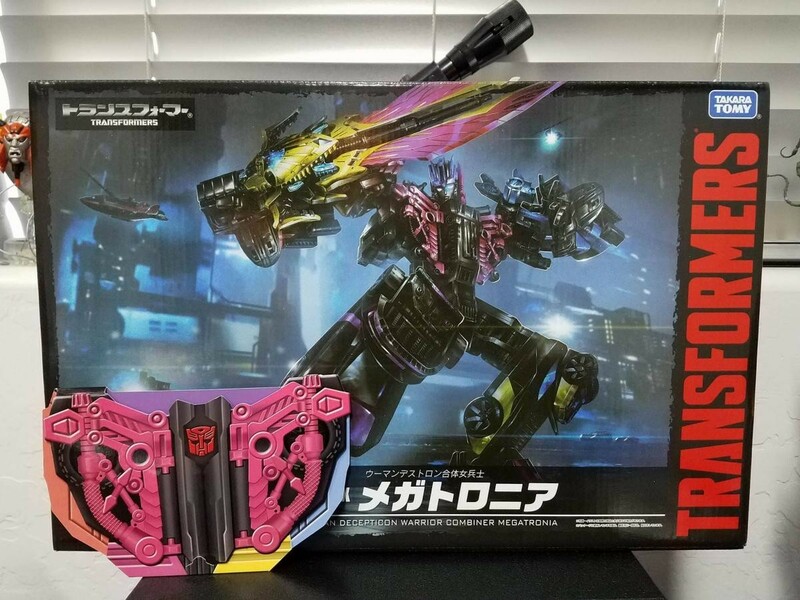 Sorry to sound so fussy, but there is a very specific reason why I want a clear shot of the box art. I'm sure someone will post it soon enough. Thanks again. 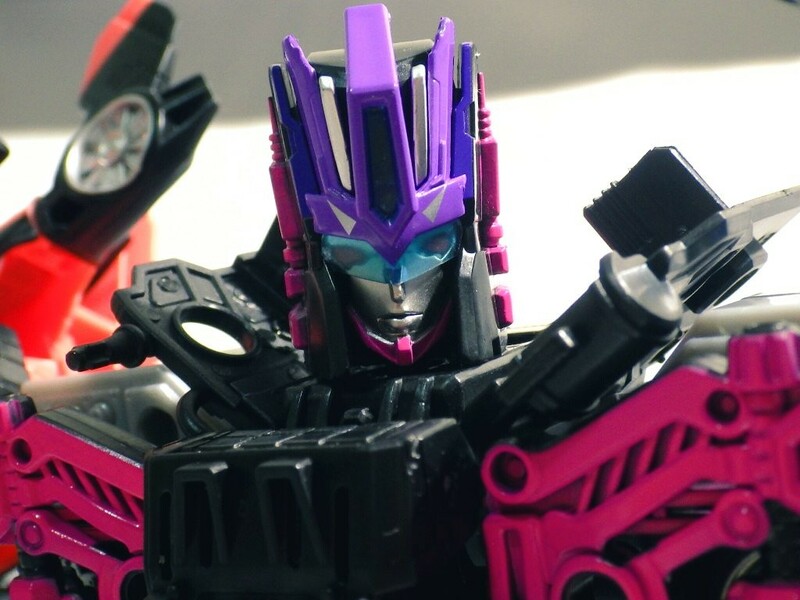 There's never been any doubt that I would get Megatronia, its just a matter of when. Looks like there will be plenty around for a while. Its odd how the UW have been. 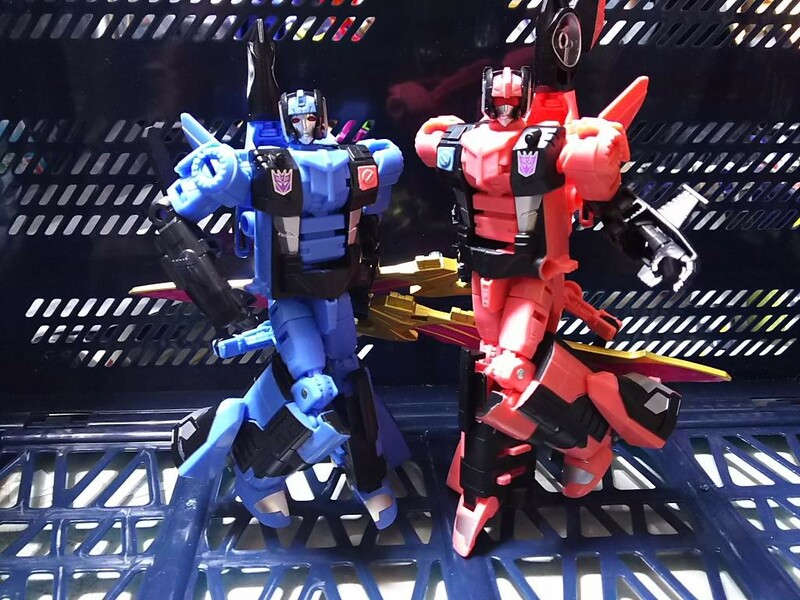 (just using numbers for ease) 1 & 2 finally stopped being available in most places a few months ago simply because they had been out for over a year. 3 & 4 are still available on some sites. 5-8 are sold out on most sites. 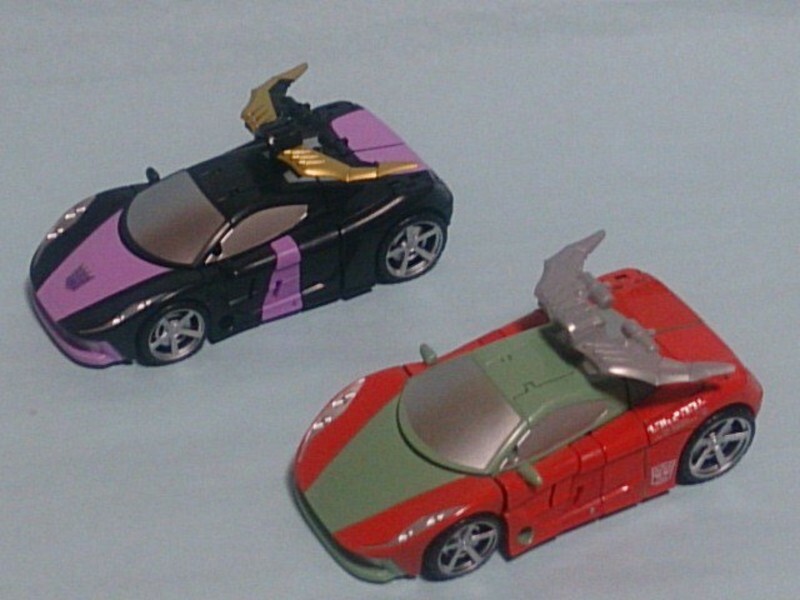 Lynx Master and Megatronia seem to be readily available and aren't selling out as fast. 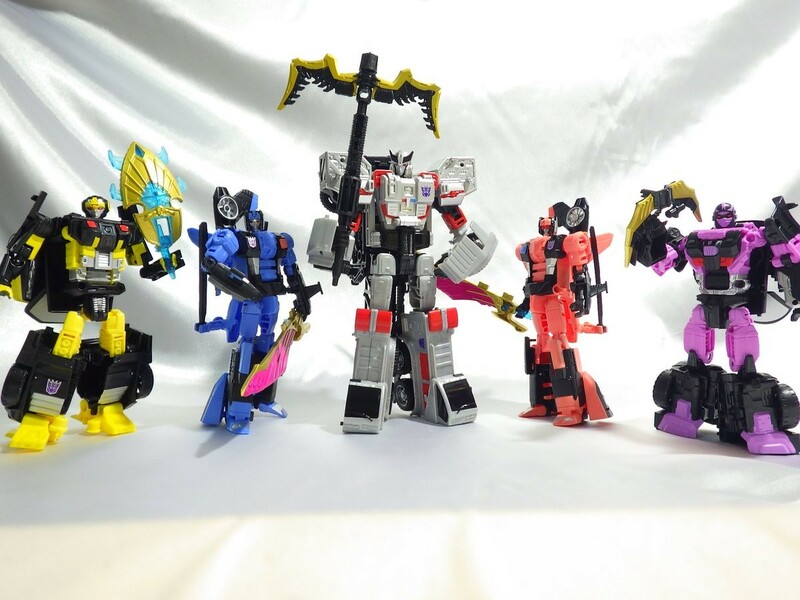 Of course ALL are still available on eBay depending on how much you are willing to pay. 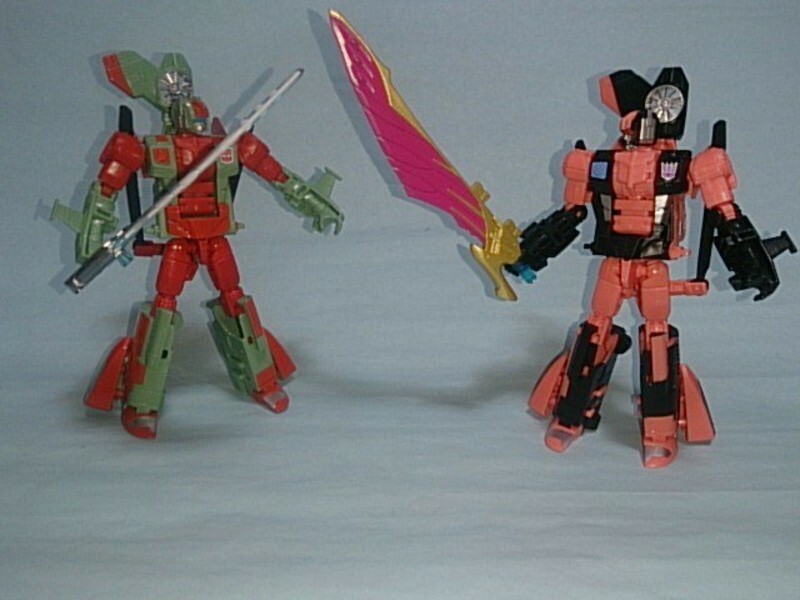 Nik Hero wrote: I'm not one of these TAKARA MAKES EVERYTHING BETTER guys, but this Megatronia is in every way better than Victorion, but one. 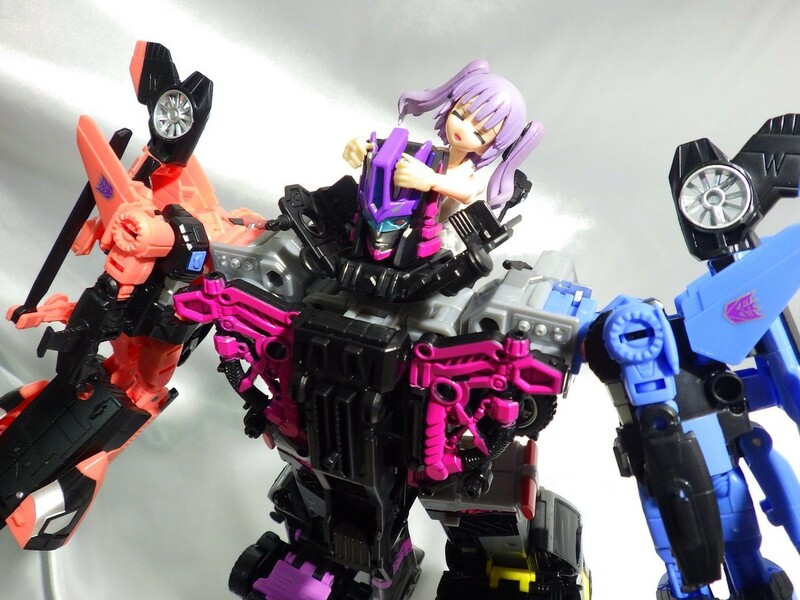 Megatronia needs Rustdust. She looks silly without her. Rust Dust as she is might actually look pretty good on Megatronia, what with Rust Dust's deco not only fitting with the theme of the 4 Guard's decos (being that Rust Dust is black, silver, and another main color), but Rust Dust's main color being green allows her to fit in well with the 4 Guard since none of them use green for their main color, allowing Rust Dust to add to their overall color theme without intrusive or redundant color overlap. Who looks best on Megatronia? Since Rust Dust has the most use of black, my gut's telling me she'll look the best. 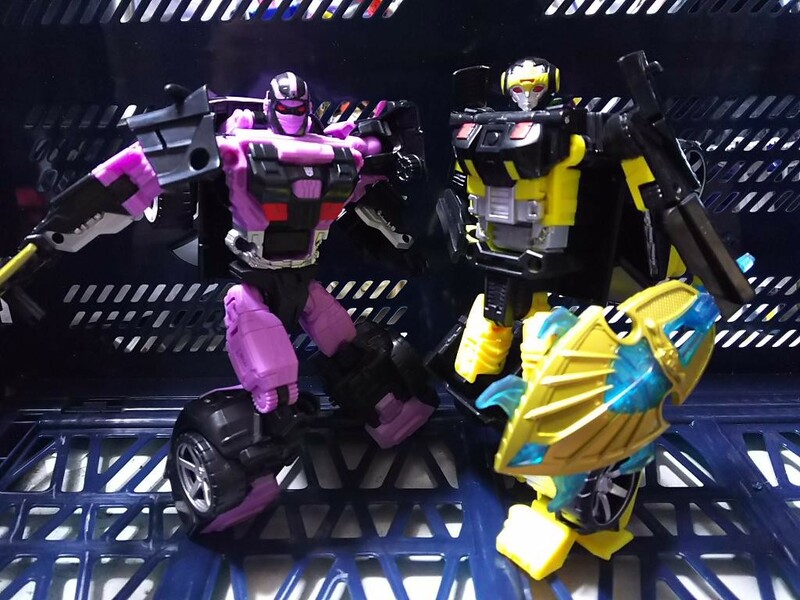 Just as we're talking about chestplate options for Megatronia, someone goes and does some comparisons with Groove, Rust Dust, and Wreck-Gar (no Override, though). So... they all look awful? 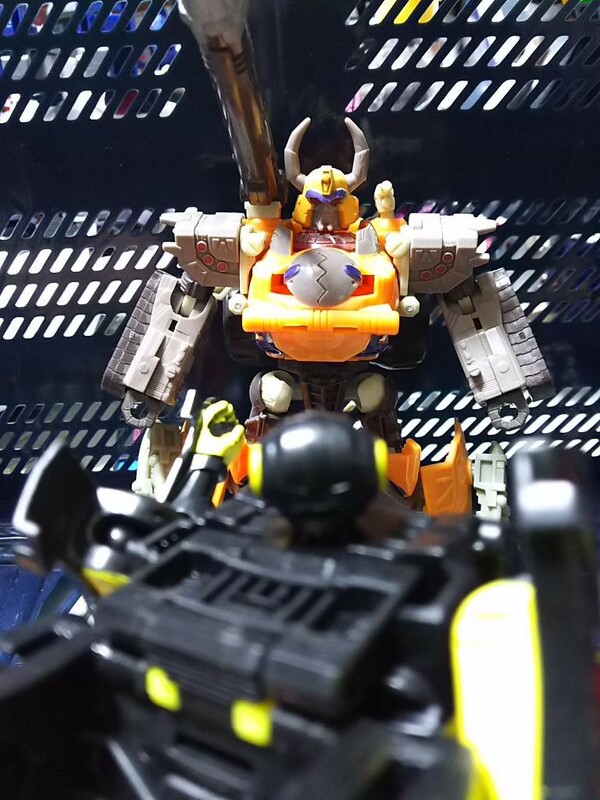 Is it sad that I think Wreck-gar looks awesome on there? 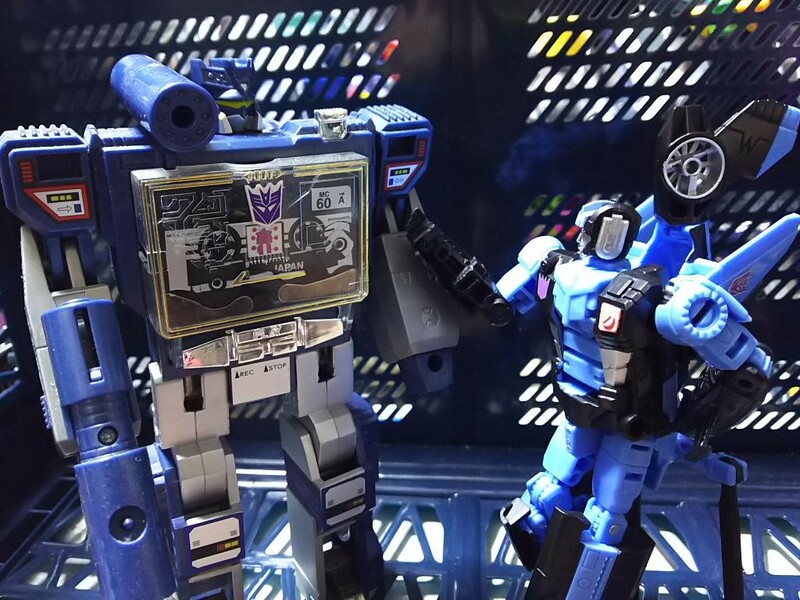 I'm a big fan of the Autobot star pasties you get with lil Groove. 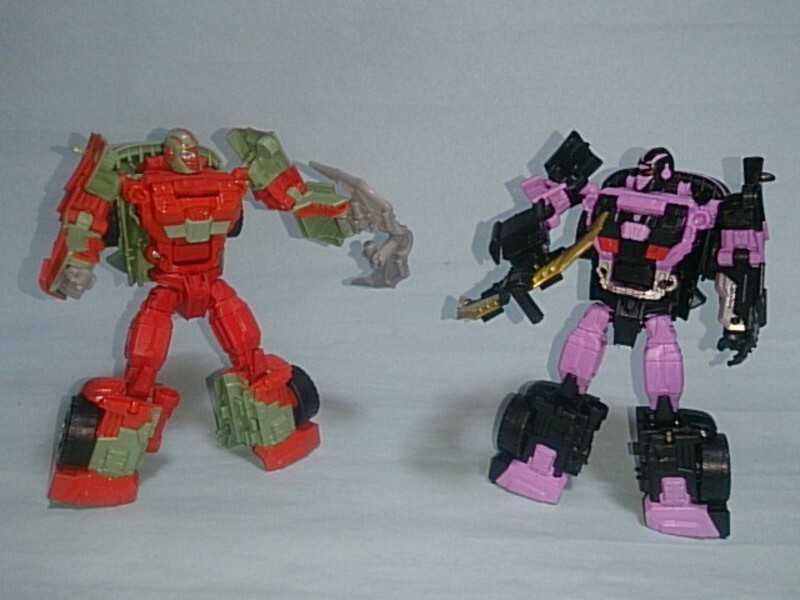 Well, on the one hand, Rust Dust has the matching black and gray as a secondary color but her green isn't saturated enough to match the non-black colors of Megatronia, while on the other hand, Wreck-Gar has the appropriate levels of color saturation but not any black or silver. 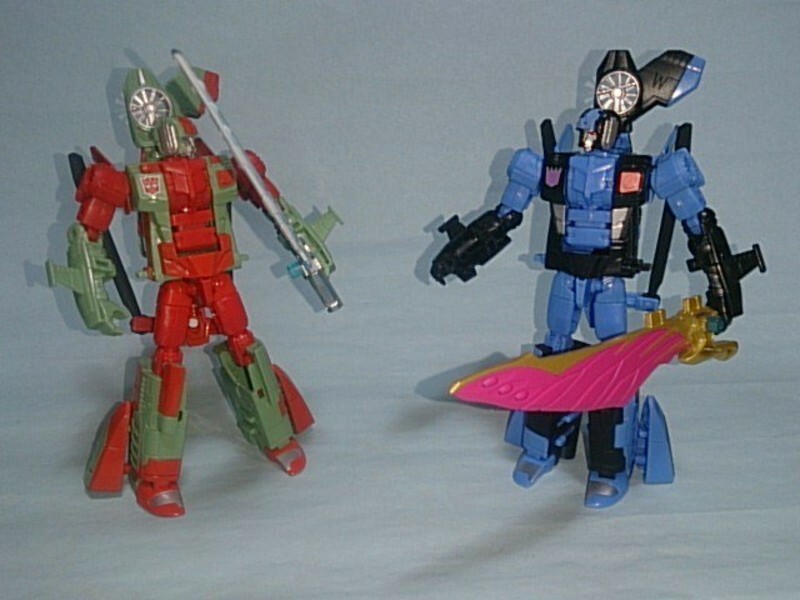 Though, all three photos are kinda fuzzy quality anyway. 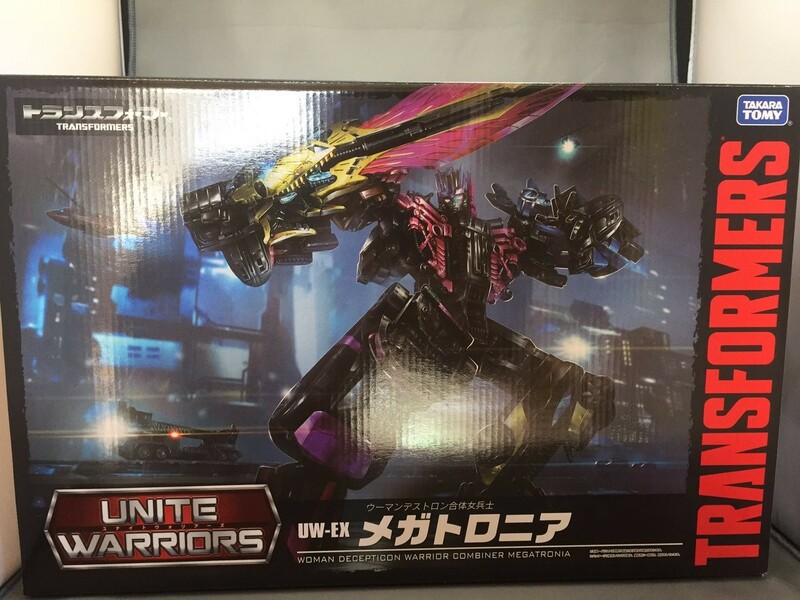 Now that fans are receiving their Unite Warriors Megatronia sets, we have many sharing images online. We selected several below. 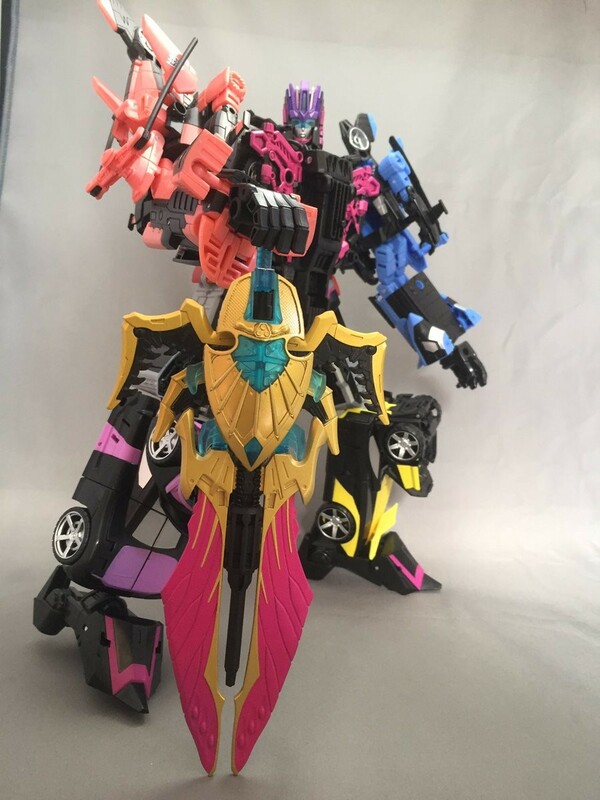 You will notice how Mega Empress' knees are correctly assembled, and there is even a display of the different chestplate options with the different uses of the Legends Groove mold. 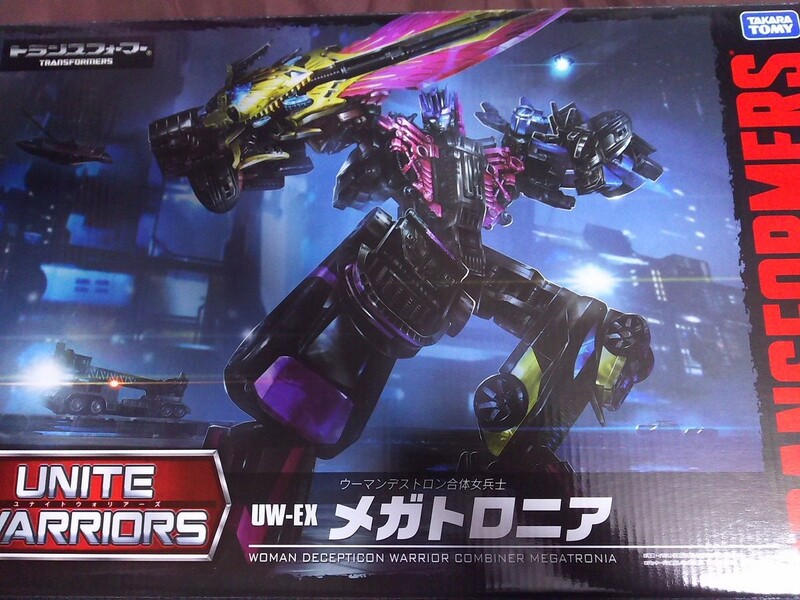 We also finally have an image of the box art. Enjoy! 5,063 pages were recently viewed by 884 unique visitors. This page was viewed 1 times on Monday, April 22nd 2019 1:37pm CDT. © 2019 Seibertron, Inc. DBA Seibertron.com. All Rights Reserved. Established June 2000. Seibertron.com is owned by Ryan Yzquierdo.